JMF Disco offers an experienced Wedding DJ in Walderslade to help with your special day. 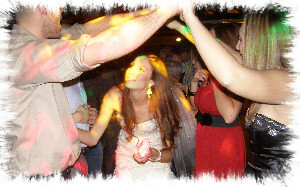 JMF Disco is owned and presented by DJ John Padmore, a reliable, experienced Wedding DJ in Walderslade. My aim is to provide you with all the help you need, from your initial phone call to seeing your happy guests leaving after a wonderful nights entertainment, at your perfect reception provided by your Wedding DJ Walderslade. Call or email JMF Disco for your Wedding DJ Walderslade to find out how I can help you. Have a look at the Weddings page for more details of the Wedding DJ Walderslade service I offer and call me to discuss how I can help make your evening very special. Contact Wedding DJ Walderslade on Tel 01795 429777, Mobile 07895 546183 or by email to discuss your Wedding DJ needs or questions. Beechen Hall is a modern community hall suitable for a wide range of functions including weddings. It has a fully equipment kitchen, plenty of car parking, disabled facilities and a sound limiter system that cut the power to your disco if it gets too loud or your guests make too much noise singing along to their favourite songs or someone accidently opens a fire exit door to let a bit of fresh air in. Lordswood Leisure Centre can offer a range of suites for your wedding seating up to 500 guests in the Grand Quee Suite - ideal for those larger wedding receptions in the Medway area. The Martin Grove Suite can accommodate up to 200 guests located on the first floor. The hotel offers a range of wedding suites suitable for 40-160 seated guests for your wedding breakfast. They offer a range of delicious menus to chose from prepared by their team of chefs. They can offer 4 different rooms for your wedding ceremony to take place in. - I'm sure I can provide you with the wedding reception in Walderslade you really want!